What Have They Done To My Potatoes? Deep down I’m just a meat and potatoes guy. I know that is hard to fathom after all the complex haute cuisine I’ve raved about, but I’d be just as happy with a baked potato – twice stuffed with cream, cheese and butter, of course! On my last food trip through Madrid and the La Mancha region of Spain I was expecting to eat potatoes, and plenty of them. They grow delicious potatoes there. In my mind the big question was fried, scalloped, mashed or baked, not whether potatoes would be served at all. You can imagine my surprise when I didn’t see anything that looked like a potato on my plate! At dinner after dinner potatoes made the menu, but when the plate arrived, the potatoes were foamed, slurried, or thickening the sauce. It was as if they were designed more to anchor the precariously stacked meat to the plate, or enhance the overall look of the dish rather than to be seen and eaten. It is so frustrating to read about them in the menu, then taste (a tiny bit of) them, without actually seeing their comforting shape. I had not one, but two chefs serve me a potato “cloud” hovering over my plate. One was so thin I could see though it, like a piece of pale amber. The other, though more substantial in comparison, was virtually a wafer. Neither could hint at the comfort eating a whole potato can bring. I was horrified down to my Irish potato-eating roots! One chef at a time, the U.S. Potato Board is conquering the consumption issue with increasingly significant influence through its annual seminar with the Culinary Institute of America at Greystone, according to Meredith Myers, manager of public relations for the Denver-based board. Myers said the potato board’s job in terms of foodservice is to provide new ideas to chefs and inspire them to use potatoes in ways they’ve never tried before. The chefs’ actions have a ripple effect as consumers then add more potato recipes to their home menus. The recipes include potato pancakes and grilled steak and baked potato salad. At the seminar Chef Wade Wiestling of the Oceanaire Seafood Room in Minneapolis introduced a new treatment for an old favorite – tater tots. Tater tots are not the main potato dish on the Oceanaire menu, though. 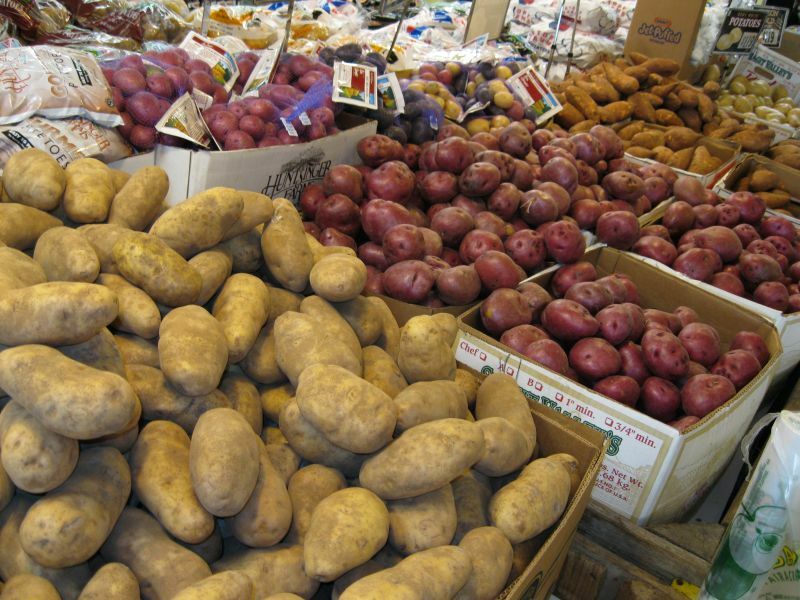 Fresh potato dishes including traditional baked russets, roasted Yukon Golds and fingerlings are absolutely vital to the restaurant, Wiestling said. There you have it fellow foodies. Potatoes are the basis of a good meal, a “canvas” if you will, not an embellishment or a structural element. Even Ferran Adria, of El Bulli fame, who pioneered the whole “molecular” food movement, switched gears with his latest cookbook “The Family Meal, Home Cooking With Ferran Adria”. Mark Bittman commented in his column in The New York Times that it was “Wonderful…good straightforward cooking.” I bet you there is no potato “foam” in it. So, the next time you are served some avant garde dish that includes a ghostly apparition of a potato – SEND IT BACK – with the message that the potato is not dead and you want a real one on your plate! The U.S. Potato Board will thank you. This entry was posted in Culinary, food, Food Fads and tagged cooking, culinary, food, La Mancha, potatoes, spain, travel. Bookmark the permalink. 2 Responses to What Have They Done To My Potatoes? Do sweet potatoes count??? They are my favourite! The humble spud still gets plenty of play chez moi – but the orange spuds are what I reach to the most! Unless, of course I am doing a marbled mash – both make the dish that extra special! YES! Wholeheartedly so. I could even add yucca and other starchy vegetables to the list. Just so long as they are real. Thanks for the visit.